Extra Floppy Wide Brim Hats can shield your face from the sun. Wear them when you most need them and still look extremely stylish. 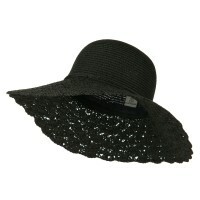 Bucket and Dressy Hats are perfect for a day at the beach, park or even for a fancy luncheon with friends. Beat the heat in these Extra Floppy Wide Brim Hats. Often, we find ourselves wanting to enjoy our time in the great outdoors on hot days, but we are in need of something that will protect us from the harsh rays of the sun. With these Bucket Hats, wearers are able to stay in the shade while enjoying their favorite outdoor pastime–whether it be going to the beach, staying in the garden, hanging out by the pool, or taking a stroll in the neighborhood. Featuring an extra-long brim, this hat was produced to allow the wearer to have their time in the sun while shielded. 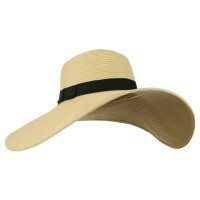 Made of straw, the hat is comfortable, breathable, and light, perfect for humid, sunny days. The Extra Floppy Wide Brim Hat is also easy to throw in one’s bag if one decides to go on a spontaneous trip. Stay cool and comfortable in this fun, dressy hat. If you need both sun protection and fashion at the same time, then your best bet is to get Wide Brim Hats. These hats come in different styles and designs thus they can be worn on different events and occasions. You can get Extra Wide Brim Hats made from different materials from straw, felt, and cotton. They also come with different accents from bows, flowers, and even seashells. Wear them to the beach, garden wedding, or just strolling in the park. But if you are looking for hats that are fashionable yet convenient to bring or carry, you can always opt for the Crushable Hats. They look as dainty as Extra Floppy Wide Brim Hats but you can fold them and keep them inside your bag if you no longer need to wear them. Made mostly from canvas and cotton, these hats provide as much comfort as possible. But what if you are looking for hats with casual flare? You can try the Roll Up Brim Hats all the time. These hats will definitely complement whatever fashion style you have. Wear them with jeans, skirt or just about any garment you have in your wardrobe.